The David Wills House and The Gettysburg Address ~ The History Girl! This week the nation celebrates the 150th anniversary of the dedication of the Soldiers' National Cemetery in Gettysburg, Pennsylvania and the infamous Gettysburg Address delivered by President Abraham Lincoln on November 19, 1863. Although Lincoln said that the words he spoke that day would not be remembered, they have instead become immortalized and resonate to this day. The David Wills House, where it is believed that he finished the address, has recently been restored and interpreted to tell the story of Gettysburg after the battle and the events leading up the establishment of the cemetery for over 3,000 fallen Civil War soldiers. 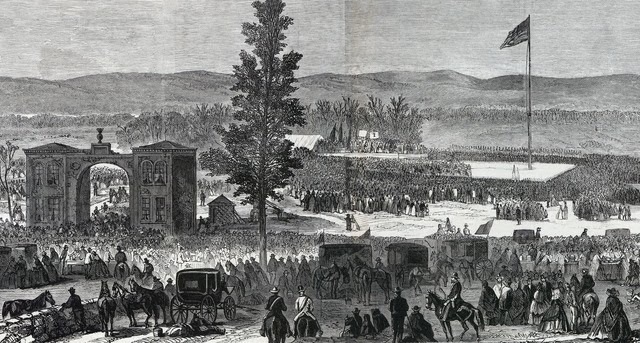 Immediately after the Battle of Gettysburg, the citizens of the small town began the arduous process of burying the dead, which amounted to over 3,000 Union and 4,000 Confederate soldiers. Local ten-year resident and lawyer David Wills became a key player in organizing the clean-up process. His three-story home, originally built in 1816 by Alexander Cobean, located in the center of Gettysburg, became the central area from which all tasks were organized. He gathered and warehoused supplies for the wounded and fought for compensation for the farmers who suffered losses during the battle. David Wills was born February 3, 1831 in Menallen Township, Adams County, Pennsylvania. He worked on his father's farm until he enrolled at Pennsylvania College (now Gettysburg College) in 1846. He graduated in 1851 with high honors and became a principal of the Academy at Cahaba, Alabama, where he taught one year. 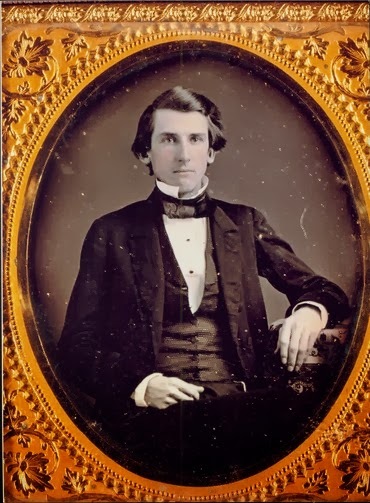 In 1853, he became a law student in the office of the Honorable Thaddeus Stevens at Lancaster, Pennsylvania and in 1854 he was admitted to the Bar. David Wills, circa 1856. Courtesy: David Wills House. Throughout his life, he held the positions of Burgess of the Borough of Gettysburg, the first County Superintendent of Schools of Adams County, President Judge of the 42nd Judicial District composed of Adams and Fulton Counties, and served a trustee of Wilson College (Chambersburg), Dickinson School of Law (Carlisle), and Pennsylvania College (Gettysburg). However, no task would be more important than the cleanup of Gettysburg after the battle and the organization of a Soldier's National Cemetery. It was David Wills who first suggested there be a Soldiers' National Cemetery in Gettysburg. Just seven days after the battle, on July 10, 1863 Pennsylvania Governor Andrew Curtin visited the battlefield with David Wills and was shocked by its condition. Thousands of men were strewn about the battlefield and the townspeople were in the process of hastily burying bodies throughout the area in shallow graves marked by wooden boards. Curtin immediately designated Wills as state agent, charged with seeing to the proper burial of Pennsylvania’s dead. At a meeting of state agents in Wills’ house several days later, the idea of establishing a permanent national cemetery for all Union dead was advanced. Governor Curtin approved and gave Wills the authority to oversee its construction. In mid-August 1863, Wills authorized the purchase of local attorney David McConaughy's Cemetery Hill summit tract and a second tract "between Evergreen [Cemetery] and the five-acre tract of Miller's apple orchard." The land purchase totaled seventeen acres for $2,475.87. 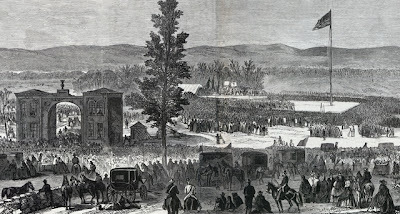 The reburial process began four months after the battle on October 27, 1863. 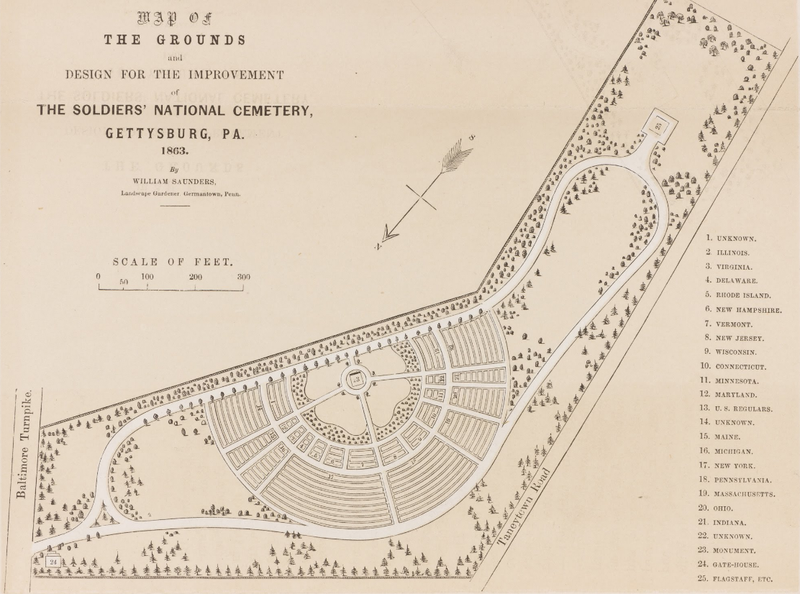 Landscape architect William Saunders was engaged to design the cemetery as a wide semi-circle, radiating from a central point to be decorated with a grand monument. The cemetery’s sections were divided by state; smaller states closest to the monument and larger states along the outer portions. Reinterments continued through March 1864. On March 21, Wills reported that the cemetery contained 3,564 total burials. 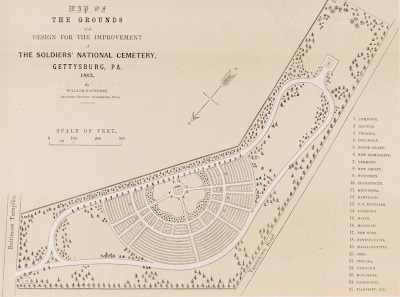 Map showing the layout of the Soldiers' National Cemetery, Gettysburg, PA. The cemetery committee decided to hold a dedication ceremony at the cemetery on November 19, 1863. Wills had proposed the dedication as a way to find “artful words to sweeten the poisoned air of Gettysburg.” The committee chose Massachusetts statesman and orator Edward Everett to deliver the main speech. On November 2, 1863, David Wills invited Lincoln to the dedication of the cemetery and to give a "few appropriate remarks." Knowing that the town will be crowded, he offers him overnight accommodations in his home. David Wills' invitation to Abraham Lincoln, dated November 2, 1863. Lincoln and invited guests traveled to Gettysburg by train and arrived at the Gettysburg train station at about dusk on the evening of November 18, 1863. His special train included others from Washington such as Cabinet members and foreign ambassadors. That evening, the Wills house was overflowing with thirty-eight dinner guests. Wills and his wife, Catherine, spent the evening welcoming and hosting the dignitaries. It was an especially busy and straining night for Catherine, who was expecting her fourth child. Overnight guests filled every room including her very own bedroom, which is where Lincoln stayed. While Lincoln, Everett, and other dignitaries ate supper together, a crowd gathered outside, calling for the President. Lincoln eventually appeared, but declined to make a speech. Later that evening at the Wills' House, it is believed that Lincoln put the finishing touches on and reviewed his ten sentence address that would forever become a doctrine of this nation, reproduced on monuments, recited by schoolchildren, and reprinted in history textbooks countless times. The following day, November 19, 1863, Edward Everett gave the main oration at the cemetery, which lasted over two hours. It was followed by Lincoln's short, yet meaningful address. A crowd of more than 10,000 were in attendance. According to Benjamin French, Commissioner of Public Buildings, "Mr. Everett was listened to with breathless silence by all that immense crowd, and he had his audience in tears many times during his masterly effort." Lincoln, he wrote, "is the idol of the American people at this moment. Anyone who saw & heard as I did, the hurricane of applause that met his every movement in Gettysburg would know that he lived in every heart." Dedication Day at the Soldiers' National Cemetery, Gettysburg, PA. 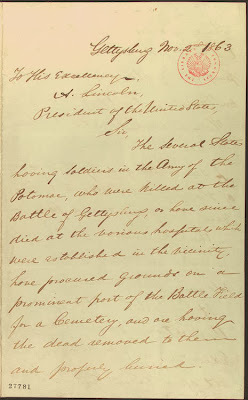 There are five known copies of the Gettysburg Address in existence in Lincoln's handwriting. Each version is named for the person who received it. Each is slightly different in its wording and punctuation. No one is quite sure which version was read that day at the ceremony, but the version that is most often reproduced is called the "Bliss Copy," named after Colonel Alexander Bliss, stepson of historian George Bancroft. 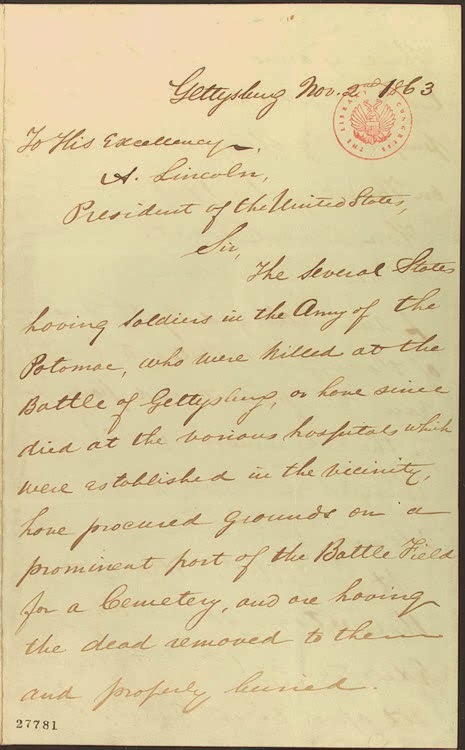 Bancroft asked President Lincoln for a copy to use as a fundraiser for soldiers. However, because Lincoln wrote on both sides of the paper, the speech could not be reprinted, so Lincoln made another copy at Bliss's request. It is the last known copy written by Lincoln and the only one signed and dated by him. Today it is on display at the Lincoln Room of the White House. Gettysburg Address Memorial at Soldiers' National Cemetery, Gettysburg, PA.
At the conclusion of the dedication the Marine Band and other members of the military escorted Lincoln back to the center of Gettysburg. After dinner at the Wills house, Lincoln greeted guests in an informal reception. After David Wills’ death in 1894, the house was remodeled by subsequent owners. The first floor was used for various commercial uses such as a drug store, music store and an antiques market. Efforts to establish a museum in the Wills House began as early as 1916, but it was not until 1945 that local businessmen opened a full-time attraction on the second floor called “The Lincoln Room Museum.” It continued to operate under various owners until 2004. In the late 1990s, the National Park Service identified the David Wills House as a significant resource that should be added to the boundary of Gettysburg National Military Park. The park acquired the property from the borough of Gettysburg in 2004. Between 2004 and 2009 the building underwent a $7.2 million restoration, in which the exterior of the building was restored to its pre-commercialization, nineteenth century appearance. Inside, first floor rooms were reconstructed based on structural evidence. The second floor Lincoln Bedroom was restored to its 1863 appearance and includes the original bed that Lincoln slept in during his stay. On February 12, 2009, the David Wills House reopened as a commemorative event for President Lincoln’s 200th birthday.